Do a few Internet searches for “WordPress developer” and you’re bound to find more than a few posts on the topic. Though my goal isn’t to add to the plethora of articles that already exist, there are a few thoughts I have as it relates to the topic. And all of it comes from time spent working in the WordPress economy, working with others, talking with others, and so on. This isn’t a post about how to hire, what salaries should be, or how to interview a person. It just has to do with the type of work we do. When thinking about what constitutes a WordPress developer, I think of the job having two distinct roles with a third being one that encompasses them both. 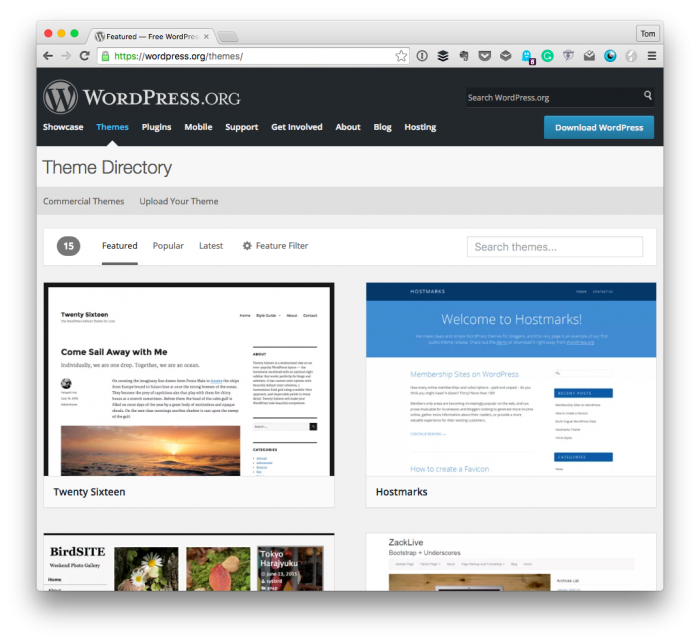 Assuming that you’re someone who aims to treat themes as a presentation layer for the idea, then I’d say that you’re a WordPress Theme Developer. At the most basic level, I’d assume that you’re familiar with front-end languages (whether or not this includes Sass or Less or other pre-processors and linters doesn’t matter as those are “nice-to-haves”). To build themes, you’d obviously need to know the basic WordPress template tags, but that doesn’t imply you know (or need to know) PHP nor that you need to do anything beyond present the data. This is not meant to leave out theme designers. In my opinion, theme designers are those who are extremely skilled with design and all that comes with it. This, however, does not mean that a designer can take the work done in Photoshop (or whatever editor) and convert it into code. Nor does this mean that a designer doesn’t know how to convert their work into a functional theme. Just as a WordPress Theme Developer primarily works on the presentation layer of a WordPress project, a plugin developer spends time focused on functionality. This doesn’t mean that they don’t know front-end languages, but it does mean that they spend the majority of the time working with server-side languages such as PHP and possibly MySQL (or with an equivalent API abstraction). I would also assume that a plugin developer as a working knowledge of PHP and a solid understanding of how WordPress hooks work. The degree to which they are familiar with advanced object-oriented programming concepts or an advanced toolkit matters only insofar as the type of work they’d be required to do. Of course, this implies there are levels of experience within the role, but the same is true of a theme developer, designer, or any role in any other job, right? To me, a WordPress developer is someone who is skilled both in building themes and plugins. Whether or not they have a preference doesn’t matter for this particular post (though I think it’s safe to assume that we all have our preferences). A WordPress developer is someone who can take a design and convert it to a well-organized and architected theme. And a WordPress plugin developer is someone who is capable of extending the core CMS with additional functionality for whatever the purposes of the project. At one point in time, I don’t know if I thought it did matter. If someone claimed they were a WordPress developer, then I would assume they have a working knowledge of everything mentioned above. But the longer I’ve worked on projects for WordPress, the more meetups, WordCamps, conversations, and posts I’ve read, the more I think it’s important to distinguish the type of developer you are. I say this because each implies a certain set of skills. When talking with other people, interviewing other people, or simply laying out a description or expectations of what you want, I think it helps to clarify what type of role you’re looking to fill. Stating that you’re looking for “a WordPress developer” leaves more questions to be asked whereas defining a bit of that in the title can help weed out potential people while also allowing said people to more clearly explain what they do. This was a huge problem when I was freelancing, foolishly marketing myself as a “WordPress Developer”. Clients were assuming I was also a designer, psd-slicer, and basically a jack-of-all-trades kind of guy. My personal opinion – I’ve always separated ‘designers’ from ‘developers’ because we specialize in two distinctly different areas. Designers make things look pretty & developers hook in the PHP code. This is not to say that designers don’t do developer work, or visa-versa. This is in fact my experience only, and it may be different depending on the individual. If in fact, a “WordPress Developer” considers him/herself an expert in both fields, then good for them. And I’d love to read your book. Yep – I know the feeling. This is why I think it’s important to clarify your role up front (but you learn after experiencing this kind of stuff). And it’s why I think it’s also important to have some peers who you can share the workload so that everythign can be accomplished. Bingo. The really talented designers (and I really only know a handful, if I’m being honest) are in a league all of their own and I’d never group myself in with them. In fact, I kind of take pride in the fact that I can say I’m not a designer but I have friends and peers who are and who I know will treat the project right. Right! And there are those few snowflakes who can do it all. And the jealousy ages ;P.
This was exactly my experience. I had a little beef with the “WordPress Developer” title anyway because I felt like the “WordPress” part was completely unnecessary and meaningless. But when the context forced me to use it, being clear on what kind of WordPress developer I was became pretty important. I find myself simply stating that “I’m not a designer” and if that’s not clear enough I usually just say “no I don’t use Photoshop” which gets the message across typically. Though I CAN do design, I’m very bad at it, and would prefer not to. I only retain a Photoshop license so I can dabble when I have the time. You did, however, forget to mention a couple of the most common types of WordPress Developers we meet when trying to hire. There are a ‘Configurers’ that have a nice portfolio where they have matched a pre-written theme, stack of free plugins and lots of stock images. Then, more serious, are the ‘drag-n-droppers’ who most often specialize is an Envato theme such as Avada or Enfold, who can really develop some great sites as long as you choose ‘their’ theme. I don’t think there’s anything wrong with this so long as the person is up front about their type of work, you know? This is an interesting post, which continues an equally important conversation about roles as pertains to people who use or request WordPress in general. I like how you’ve described the different types of WordPress Developer, and then synthesized them into an overall “WordPress Developer”; with possibly varying levels of experience. Many small enterprise or website owners don’t yet know the nomenclature, and won’t likely appreciate that there is a difference. This is why “anyone” can be “any kind of WordPress developer”; although there is a difference. And also this: “there are levels of experience within the role”. In fact, I believe there are multiple roles that work with WordPress and these roles might be of service to site owners: “configurers”, “customisers”, “tweakers”, “administrators”, etc. One could class such roles as “WordPress Knowledge Workers”. This is not a good or bad thing. Its more a case of “this is a typical role for a WordPress Knowledge Worker”. Then there’s the “Technologist”, who may be platform agnostic, but specialised on a specific technology, such as eCommerce, or eLearning delivery. In my mind, none of the above are “WordPress Developers”. And that is not a good or bad thing. Its just a thing. In my view, if one were to consider the above qualities closely, it disqualifies a large proportion of WordPress workers. And this is neither a bad thing; nor a good thing. Its what it is. I’ve seen people refer to themselves as “Genesis Developers”, or “Avada Developers”, or “Divi Developers”. That may well be the case and I’m certainly not in argument with that claim. Inasmuch, however, as their work is derivative and dependent on another, separate, prior existing object, would it then be correct to still consider them to be “WordPress Developers”? Having said that, there’s nothing wrong with aspiring to grow and evolve from being an “Advanced User” or “Knowledge Worker” into being a “Developer”. Many of us are on that road, and I think that’s a reasonably fair place to start from. There’s also nothing wrong with remaining a “WordPress Knowledge Worker”. There’s certainly plenty of demand for that role in today’s market. It is, however, important to clearly set expectations for a business or client, who may be looking for an actual “WordPress Developer”, and not a knowledge worker, or administrator. The problem and risk with this setting of expectation, is the difficulty of being able to quote higher rates. For example, if one is seen as just a “Knowledge Worker”, or “Technician”, they may not be seen as being as valuable as another person who represents themselves as a “Professional WordPress Developer”. We’re still in a business clime where title, accolades, and perceived achievement influence decision makers, and thereby directly affect a service provider’s income and bottom-line. So, for example, a simple guy/gal who responds to an enquiry and who is up-front about their experience and capabilities with the WordPress platform, is likely to be ignored in favor of the self-proclaimed “WordPress Developer” or “specific-plugin/specific-theme Developer”. There’s no way for a website owner to tell the difference. “…I’ve had a bad experience with many WordPress Developers….” (an actual quote). Well, yes, that would be the case, because it was as though the Client was asking a “joiner” to build them an entire house (with no architect or blueprints involved). Good post. This might be just semantics, but I think there might be a new category in the future: “Application developer”. I think it’s coming :).